Your Mercedes is made up of tons of parts and pieces all working together to produce a smooth-running experience. Your engine runs off of power generated by various components that aid in the ignition and combustion process. Depending on what type of engine your car has, the parts that generate heat and power for the ignition process differ. For instance, in a Mercedes diesel engine, rather than utilizing spark plugs, the engine uses what are called glow plugs. Glow plugs are a critical component of your Mercedes’ engine because they provide the heat and power necessary in order for the car to start, let alone provide enough power to the other systems of the car to make it “go.” Many Mercedes drivers experience issues with the glow plugs, and what is called a glow plug timer relay. We know that all of this automotive jargon can sometimes be lost on drivers, and that’s okay. In this article we’ll briefly discuss what glow plugs and glow plug timer relays do for your Mercedes and why their ongoing functioning is critical for your engine. Furthermore, we’ll provide a little more information about the warning signs that may indicate that your glow plug timer relay or the glow plugs themselves are failing. What Do Glow Plugs and Glow Plug Timer Relays Do? As previously mentioned, glow plugs provide power generated by high temperatures that is used in the combustion process. Mercedes’ diesel engines work differently than most vehicle engines; they utilize high levels of pressure and heat to start the engine via engine cylinders and glow plugs rather than spark plugs. Glow plugs act as a heat source for the cylinders, and when they aren’t functioning properly it can cause significant starting and performance issues. Since glow plugs generate high levels of heat, the longer they stay activated unnecessarily the more damage they can incur. However, if they don’t stay on long enough then they may not provide enough heat for the combustion process. Therefore, glow plugs require a timer with relays that essentially tell the glow plug to activate or deactivate at the appropriate times and intervals. If your Mercedes glow plug timer relay isn’t working properly, it will certainly cause starting and operating issues for the driver. The check-engine light comes on when your Mercedes’ ECU finds an issue with the engine operative systems. 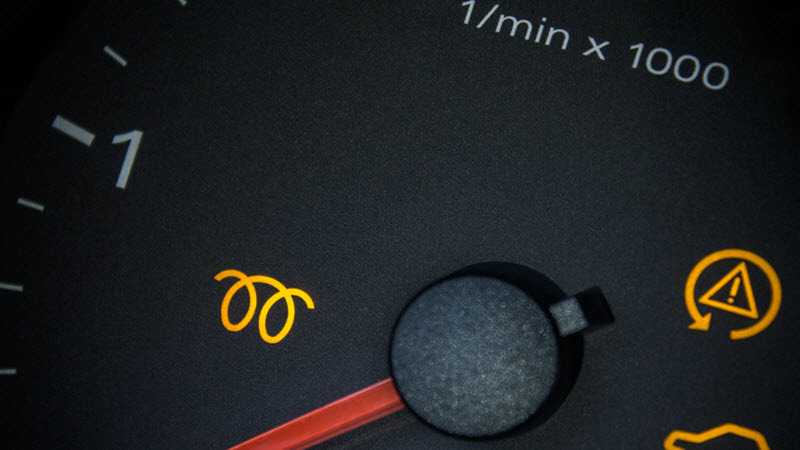 The engine receives a signal from a various part or system that’s malfunctioning and relays the message to the driver via the check-engine light with a specific code attached. This code will help your mechanic find the source of the problem, and it must be read by a professional with the proper equipment and skills. This can also be exhibited by the glow plug warning light in your Mercedes’ dash. Engine performance issues are at the heart of glow plug- and glow plug timer-related problems. When the glow plugs can’t generate enough heat and power to the engine, or when the timer relay isn’t working properly, it will have a difficult time starting smoothly, or it may not start at all. If the glow plugs themselves aren’t functioning appropriately, then it will significantly affect your engine’s performance. This might be a gradually-declining process where you’ll notice a decrease in performance over time as the glow plugs degenerate, or it could happen dramatically overnight. The experts here at Ronin Autowerks serve a diverse clientele of Mercedes vehicles in the areas of Fullerton, Anaheim, and Yorba Linda, CA. Glow plug and glow plug timer relay issues aren’t uncommon in Mercedes engines, and we have over 2 decades of experience diagnosing and repairing such issues. If your Mercedes is exhibiting concerning engine performance or starting problems, please contact us right away to schedule an inspection.